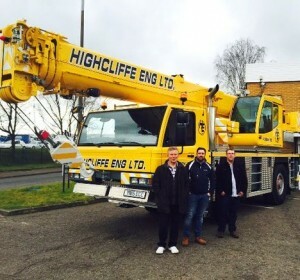 Yorkshire crane rental company Highcliffe Engineering has taken delivery of its first new All Terrain crane – a 40 tonne ATF 40G-2. The compact two axle crane features a 35.2 metre main boom plus a nine metre swingaway which can be offset by zero, 20 and 40 degrees. Based in Mexborough, South Yorkshire, the company was established in 1983 by Ian Wolstenholme as a steel fabrication company and gradually evolved into a mobile crane hire company after buying its first cranes in 2000. It now runs a fleet of mobile cranes ranging from 15 to 50 tonnes, most of them being truck or All Terrain cranes in the 25 to 50 tonne bracket.